Posted 12/20/2018 3:03pm by Leslie Cooperband or Wes Jarrell. Browns and grays dominate the farm’s color palette this time of year, offset by the reds of the barn door and the pavilion roof. The few days of blue-sky sunlight and the ribbons of orange and yellow strewn across the western sun-setting sky provide much-needed visual relief as we approach the darkness of the winter solstice. Life pushes back against the inertia of hibernation. The resident hawks, perched on fence posts, salivate over unimpeded views of desiccated grasses barely hiding the raised tunnels of their favorite prey. The pond, still with open water, provides respite for chatty migratory geese and ducks. The herons linger too, sometimes sighted far from their usual proximity to water, perhaps hoping to score a “turf-born” morsel rather than their usual “surf-born” fare. This is the beginning of down shifting, the time of year when we can walk the farm and take stock of lingering needs. The greenery that hid the piles of rotting wood, burn piles and old farm equipment has died back, leaving the exposed nakedness of patchy pastures, bare-trunk fruit trees, discarded moldy hay bales and messy compost piles. The farm dogs embrace our own tendencies for laziness. Wes has to fight them for the coveted recumbent position on the couch. Exposing the myriad of winter projects is akin to tackling a vice; acknowledgment is the first step in a long line of steps to improvement and change. For now, we will allow ourselves some time to rest, to indulge the slumber that darkness encourages. Winter is the farmer’s best friend. We’ll be at the final indoor “Market in the Square” of the 2018 season, inside Lincoln Square Mall this Saturday, 8 AM to 12:15 PM. We have our regular spot next to Blue Moon Farm. If you miss us at the market, come see us at the farm. We’re open 1-4 PM Saturday and Sunday through December 23rd. Our farm store will be closed in January and February, except for special events. So, come out for a little goat lovin' and a warm drink or cheese board. If you think our farm is far from town, in fact, we are REALLY close to Champaign-Urbana—literally 5 miles from each downtown. We are also within two miles of both I-74 and I-57. Follow directions on our website if you’re not familiar. Fresh chevre: plain, herbs de Provence, cracked pepper-the milk is SUPER rich and the texture of the chevre is perfect for a simple holiday dip. Try one of our flavored chevre, or just drizzle the plain chevre with some local honey or a balsamic vinegar reduction, serve with raw or pickled veggies. Goat Milk Feta: Our flavorful and tangy feta is aged and packed in whey brine. It's perfect to crumble on a fall salad or a top a hearty stew or bowl of chili. Check out our newest recipe “Baked Feta with Olives, Honey & Thyme.” This is PERFECT for simple & delicious holiday entertaining! THIS IS THE LAST FETA IN THE HOUSE FOR THE SEASON (CHEESE HOUSE), SO GRAB A CONTAINER THIS WEEKEND! We won’t be making more feta until next spring. Spiced Feta in Extra Virgin Olive Oil- Don’t to mess with recipes or cooking for the hordes of holiday guests? This ready-made appetizer is perfect with some crusty bread and a jar of fancy pickles. It’s all dressed up and ready to go home with you. Let the container come to room temperature so that the congealed olive oil liquefies. Moonglo: Spring milk batches of this raw milk tomme (sort of like a Gouda, but not really) produce a more mild, tangy paste with hints of pineapple. Melts well, or just slice and enjoy with your favorite salami. You could even use it in place of Swiss style cheeses for fondue OR grate it over roasted veggies or a vegetable gratin. If you really want to impress your holiday guests, try this recipe for roasted pumpkin-filled fondue pots. Gelato: If you’re looking for a perfect accompaniment to your decadent holiday desserts, try our gelato. We only have a few pints of vanilla left. These are the last pints of the season. Pints only at the market ($10 each or 3 for $27); scoops at the farm during open hours. 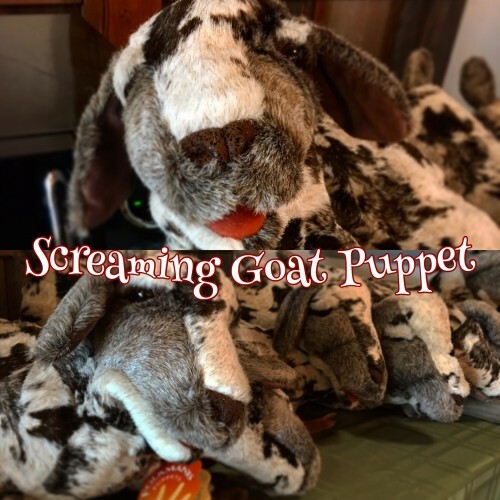 We’ll be bringing some other gift items and staples to the market including tea towels, t-shirts, hooded sweat shirts, batik aprons, cheese boards, jams, and goat stew meat. Tulsi Tea from Delight Flower Farm-tulsi is a variety of basil known for its sweet aroma and medicinal properties. With a spoonful of honey, this tea will warm you up and keep you healthy during the cold months ahead. PFFC goat meat—we have one pound packages of stew meat (1 lb. packages, $13/lb.). Pasture raised, very lean and mild, try the meat that most of the rest of the world enjoys regularly. Rustic cheese boards--hand-made from wood milled right on the farm (maple, cherry, ash)—these 3-4 ft. boards are lightly stained with a coffee stain. They are perfect for creative a simple and elegant cheese and wine board for your holiday entertaining. ONLY $30/each!! This is the final weekend that the farm will be open before we close the farm for the winter. Come visit during open hours: Saturdays & Sundays, 1-4 PM. 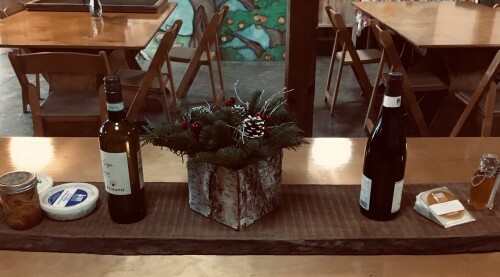 Pet the goats, enjoy the natural surroundings in early winter (the farm is really beautiful this time of year), relax inside our cozy farm store with a warm drink, a glass of wine or beer and a “build your own” cheese board. We’ll also have some special treats for you to enjoy with a warm coffee drink or some mulled wine (Glugg)-chevre cheese cake by the slice and warmed pecan buns. We have had a wonderful 2018 season filled with beautiful goats, delicious cheese, memorable farm-to-table events and amazing dedicated staff. We want to thank you, our patrons, for supporting us and helping us end the year on a very positive note. We also want to let everyone know that things will continue “business as usual” at the farm in 2019. In fact, we are already starting to plan for even more events at the farm next year! Stay tuned to see what we’re planning. In the meantime, stay warm and enjoy the comforts of the season with delicious local foods and good company. Happy Holidays to all and we’ll see you in the New Year!! Copyright 2018. Prairie Fruits Farm & Creamery, LLC. 2018. All rights reserved. 4410 N. Lincoln Ave., Champaign, Illinois 61822 Prairie Fruits Farm & Creamery, LLC is responsible for the content of this email. Please contact Leslie Cooperband or Wes Jarrell with any inquiries.